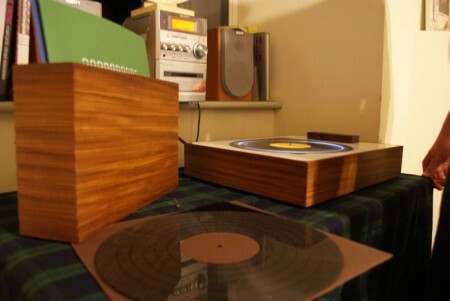 Pointless, get a real record player, or a Ipod dock. I don’t agree with you at all that the album is dying. It may be on the wane, but I believe it has a huge amount of life in it. Radio is a lively niche despite the advent of television. I’ve been publishing Hard Format for just over three years now and I’m ever more fascinated by the diversity of approaches to the format in design terms. Having said that, I’m not sure whether you’re saying that the physical album or the idea of an album as a coherent amalgam of tracks is at risk. This looks wonderful, bandwidth’s exceeded on Martin Skelly’s site at the moment, will have to check back later. not everyone has the cash to invest in a vinyl collection and not all music is available on vinyl. A dock misses this point, this is about reenacting a ritual that many people associate with listening to music. In the article I was referring to the idea of an album as a whole. I think the physical medium is also endangered, but that’s another story. I guess I used the word “dying” a bit liberally; I know there are a lot of people still enjoying full albums. But the more I talk to younger people — who have known nothing but MP3 — the more it becomes apparent they are increasingly consuming music track-by-track. That’s not to say that bands will ever stop making albums or that people will stop listening to them in their entirety, it just seems like the convenience of digital music has led to major shifts in how people enjoy music. When you had to get up and fast forward the tape, or get out a new record (or even change the CD) to listen to something else, it seemed like there was a better chance you might listen all the way through. yeah, his site was down when I posted this, hopefully it comes back up soon. Although the month is almost out so I’m sure it will reset on the 1st. Reading over how this thing works a few times and thinking of it, I really like the idea. It reminds me a bit of how I used to make mix tapes or CDs that usually ended up playing at home. The form factor however isn’t really for me. I would prefer something a little less tall. Vinyl has proved it has staying power among “music people” even with the younger crowd. Vinyl offers an experience that digital just cannot reproduce: the actual physical medium, the large artwork / sleeve goodies, sound quality, side a / side b track sequencing, and something about the care in handling the records is nice. Record hunting versus Itunes shopping? come on. That being said I use and enjoy the luxuries of digital music formats daily. There is a purpose and place for both. Digital formats are obviously causing huge changes in the way we present, buy, and listen to music. The digital revolution has way more pro’s than con’s and vinyl is there to remedy those con’s. Unfortunately I think our greatest loss is the mix tape. I appreciate a good digital playlist but it lacks the heart and thought that goes into a cassette someone made just for you. Finally, and more on topic, I think the playlist player is a pretty cool concept and would look great in my living room. However, half the fun of music and making great mixes is sharing them with friends and I don’t think I could convince many of my friends to buy this, plus they remind me more of laserdiscs than records. Then how the heck are they going to afford this thing? I bet you could put together a respectable pile of vinyl for the pricetag of the playlist player. Thankfully Scott you are wrong. As someone who too grew up with LPs then tapes and eventually CDs I’m ecstatic that vinyl is every where now, covering almost every genre. From reissues to new releases you can get a record anywhere – at a flea market or Urban Outfitters. The older guys like myself are happy to have back and still gawk over limited editions or hard to find original issues, and hopefully the younger generation will develop their own emotional connection to the format and help sustain it for many more years to come. I also for the record, don’t mind CDs. Rounds by Fourtet is one my favourite albums and plays beautifully uninterrupted digitally. I bought their latest release on the double vinyl issue and honestly I think the experience would have been more enjoyable on CD. Having said all that – the device is beautiful from a design perspective and interesting conceptually – just not entirely necessary. Magic Bryan: As sad as it is to say, vinyl is not “staying in power”. 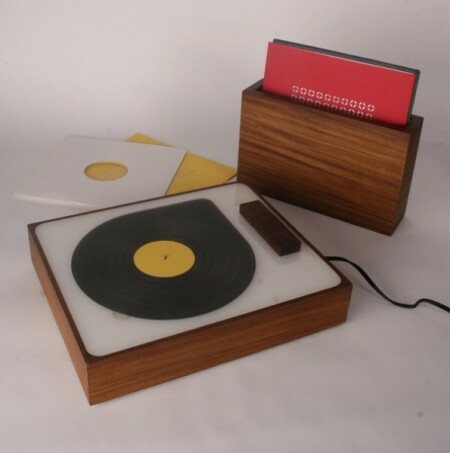 The LP has made a valiant return only as a novelty item. Significantly fewer LPs were pressed in the late 80’s and 90’s (they were completely buried by tapes and CDs). Only over the last five years or so are there so many LPs, both new and reissued – because it’s hip and it sells. Once other music mediums are discovered, my guess is that vinyl will once again fall to the wayside. Admittedly, I don’t fully understand vinyl emulation, but it surely it can’t produce the same quality as artists who recorded analog (in the days of old)… that is half of what makes the sound of an LP so rich and warm. I do think the emulator is great in that you get a vinyl-type reproduction without the hassle of searching for/buying albums. It can be personalized and saves some shelf space. If it’s reasonably priced, it could be a great little toy – but its less authentic and less convenient as other reproduction means, and like J to the D said, not all that necessary. People often forget that in the 50s/60s teenagers consumed most if not all of their music as singles (i.e. 45s). The mainstream pop world just wants hits and singles. I say let them have ’em. But people who are true music fans will always want to hear an artist’s complete thoughts, from start to finish, whether that’s a 10 track album or some other future incarnation. Doyle: I’m afraid you misquoted me “staying power” not “staying in power”. 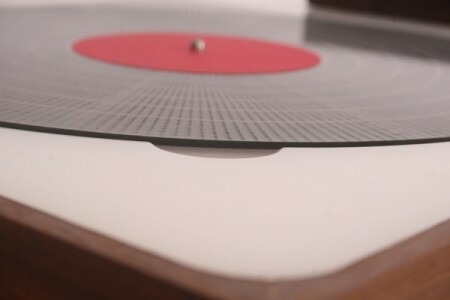 Vinyl is the only audio medium I can think of that’s still around and relevant since it’s inception. It never went away, and I think people are realizing it won’t go away which is the cause of the recent revival. Vinyl w/free digital download is great. Nobody has mentioned DJ’s either, I heard they like records, too. I don’t think that the digital format is killing anything. Computers are getting more and more powerful every day and people are learning how to do more with them all the time. Think of NIN The Slip and how awesome it is that each song has its own art that displays on your ipod. Take that a step forward and each song could be a music video or paired with its own visualization generator. Or another step forward the song and video could be a different experience based off of user defined parameters and on the fly generation of stuff utilizing the devices processing ability. That could be like making each album an app that does unique things. So while you are right, digital does not replace vinyl, I do think that it opens up a new door in music distribution which could be fun to explore.